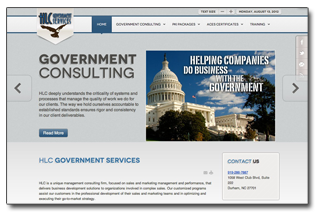 "HLC Government Services, LLC has been using Stephen at C-Support since weopened the business back in 2008 and C-Support designed our very first website and we have since had them build another one as our company continues to grow. Stephen is very creative and brings a lot of marketing value to HLC as well and we have added Google Adwords and other clever marketing material to our site." "We just looked at the new site and you are just as amazing with websites as Michael is with dogs ;o). It really does look great! I love the photo you took at the top of our property! This looks great and I really like it thus far. Your website is one of the most important marketing pieces for your business. For many potential customers its the first place they go to qualify a business to start their decision making process. Website design goes far beyond making a website look pretty. Its about getting that user to connect with you. Its about the conversion. Conversion optimzation is an art that we truely understand. Where to place a contact form, or phone number. Do we use a live chat feature or is it just a bother. Are you in front of your potenial customers during their decision making process? Is your website going to capture that potential business? Does it represent you well? Are you making money from your website? Whether you are small business or large global brand, we can build a website that will not only look great, but effectively drive business to you. Have a 10 minute conversation with us and you will quickly see how we can help your business. Steven is in my opinion the brightest mind in web design, SEO, and Google. He is easy to work with and has a unique ability to take complex ideas and make them easy to understand for the average person that is looking for results. He is result orientated and honest, a rarity in many companies. If you use anyone else you are settling for second best. I asked CSupport to put together a Niche website to attract more contractor clients. CSupport was very accessible during the process and worked to get the site up and running in a short period of time. Their focus is on using the website to actually make money for your business. CSupport has years of experience in website design and SEO, and I highly recommend CSupport to any business or organization looking for a website that gets results.